Crystal Blogs Books: Introducing . . . The Gibson Project! Introducing . . . The Gibson Project! We all have one. That one author you love so much, you'll go to great lengths to get their books. The author that'll introduce you into a new genre you didn't know you would love. Or they'll open up a door for you that you didn't know existed at the time. That author for me was Rachel Gibson. She opened up the world of contemporary romance. The characters she created cheered me up when I was sad, made me laugh until I cried, kept me up when I had class the next day. I'm happy when her books are released and crabby when I finish it the next day because I always wish I had gone slower. She made fun of my favorite hockey team in her very first book, but I've forgiven her. It was Rachel that introduced me to Avon Romance and without her, I probably wouldn't be an Avon Addict today. It has been years since I've picked up one of Rachel's older books and since I can't, for the life of me, remember what happened in some of those books, I have decided that it is time for me to finally re-read her books, from start to finish, on my Kindle. I wish I was better with graphics. My sad attempt... LOL. 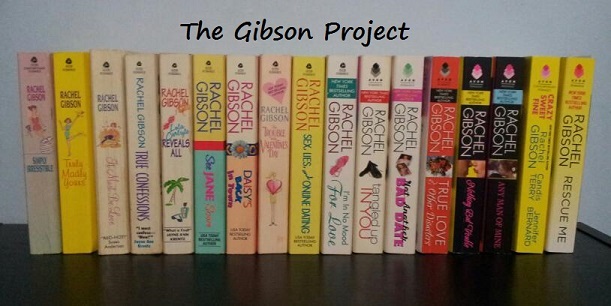 Each Monday, from now until December 23rd, I will be re-reading, posting, and reviewing each of Rachel Gibson's books from Simply Irresistible to Run to You. I will try my best to read them in order, but since Rachel's newest book and novella are released next month, I will most likely take a break to read/review Blue by You and Run to You. I know I should keep them until I finish, but let's face it...I have no willpower. Are you ready for the best part? Avon Romance has graciously donated some books for me to giveaway! More information on the giveaway(s) will come shortly. I know there are other Gibson-ites out there. Come and join me in re-reading Rachel's books! New to Rachel's books? Perfect time to pick one, two, or all of them up and read along. A list of Rachel's books and the dates I'll be posting will be located on the left side-bar. I LOVE RACHEL GIBSON....I re-read SEE JANE SCORE at least twice a year! !